Diverse, inclusive teams are a company’s greatest asset: they challenge assumptions, drive innovation, and we believe strongly they are a competitive advantage. In the past year, Uber doubled down on its commitment to creating an environment that works for everyone, where people of every background can thrive. We have made meaningful progress over the last year, but we still have a lot of work to do to increase representation of women and underrepresented groups. When benchmarking our data against last year’s numbers, underrepresented groups in leadership roles increased by 2.5%. We’ve also increased our proportion of women in the workforce by 1.9%, to 38% overall. More specifically, representation of women in technology roles is up 2.5%, and women in technology leadership roles is up 4.3% from last year. Of course, diversity isn’t just limited to gender and race. For the first time, we also asked employees to self-identify as part of the LGBTQ community. Over a third of our employees opted to take the survey, and 15% of respondents identified as LGBTQ. We hope to be able to share data on the representation of other facets of identity in the future. While the numbers are important, evolving our systems and culture are also essential to create a more inclusive environment. Here’s what else we’ve done over the past year. While we recognize it isn’t a panacea for creating diversity in the workforce, equitable recruiting and hiring practices are critical for building a strong foundation for change to occur. That’s why Uber has completely overhauled the way it recruits and hires. We’ve trained more than 1,000 new interviewers in engineering, and we’ve taken steps to remove bias across the interview process—including partnering with outside experts to rework over 1,500 job descriptions, making them far more inclusive. Our teams instituted structured interviews to ensure that candidates are asked the same questions and judged against the same competencies. We also implemented an “Interview Moderator” program where employees not involved in the process observe deliberations among interviewers to ensure objectivity. It’s not sufficient to find talent from all walks of life; once they arrive at Uber we need to support our new hires and ensure they feel a sense of belonging. Over the past year, our employee resource groups (ERGs) have seen exciting new growth. Across the globe, ERGs expanded from around 2,000 members to almost 7,000 members across the company. To take things one step further, we created Why Diversity Matters, our first global diversity workshop program designed to stress the importance of cultivating and keeping diversity of experience, background, and thought on our teams. This workshop is the foundation for all programming that will follow and crucially provides a common language and a set of commitments we will utilize across the company. Nearly 4,000 employees globally have participated in this live and experiential workshop. Another crucial part of the employment experience is ensuring there is no bias in our policies and making sure all of our staff are treated equitably in order to thrive. One of the most important steps we took last year was to ensure that every employee receives fair pay for the work they do. After a thorough analysis of compensation across our workforce, we made changes to ensure aggregate race and gender pay equity across Uber. We’ll continue to keep an eye on the data to to ensure we maintain fair and competitive compensation over the long term. Doing great work on diversity and inclusion inside our company isn’t enough — that’s why we’re partnering with other organizations and outside experts to increase our impact. Last year we announced a fund dedicated to supporting organizations that are working to bring more women and underrepresented people into tech. Today, we’re excited to share that as a part of this, we’re now partnering with BUILD, Code.org, and SMASH, following our work with Girls Who Code and Iridescent. We’re also seeking guidance from some of the leading minds on diversity and inclusion. This year, we created a Diversity Advisory Council to help us address diversity, equity, inclusion, and belonging initiatives. The Council is comprised of both Uber employees and six industry leaders, all of whom offer their perspectives and guidance on both high-level strategy and specific changes we can implement. Lastly, this month I was excited to welcome our first ever Chief Diversity & Inclusion Officer, Bo Young Lee to Uber. She shared some inspiring thoughts about why she joined Uber and her vision for the company in the future. I am truly optimistic that together we can make Uber a place where amazing talent from every corner of society can thrive and grow, and where each employee can achieve their highest potential. 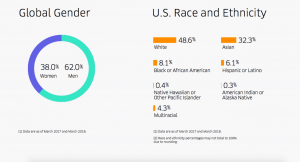 Learn more about our efforts and see the data we’re releasing today at https://www.uber.com/about/diversity.